Trinity College, Cambridge. MS. O. 3. 58. XV Century. Source: J. A. Fuller Maitland and William Smyth Rockstro, English Carols of the Fifteenth Century, from a MS. Roll in the Library of Trinity College, Cambridge. (London: The Leadenhall Press, E.C., ca. 1891), Carol No. XIII, pp. 26-27, 54-55. 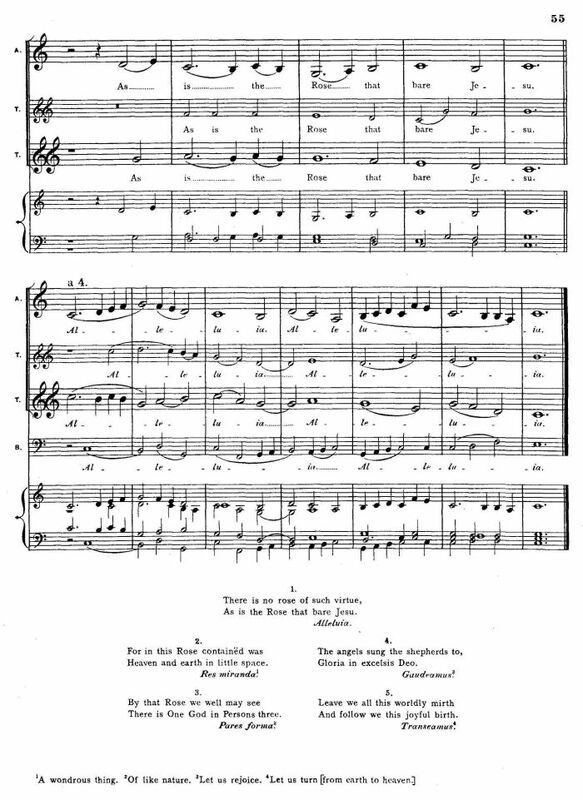 Sheet Music from Richard Runciman Terry, Two Hundred Folk Carols (London: Burns Oates & Washbourne Limited, 1933), Carol #195, p. 45. 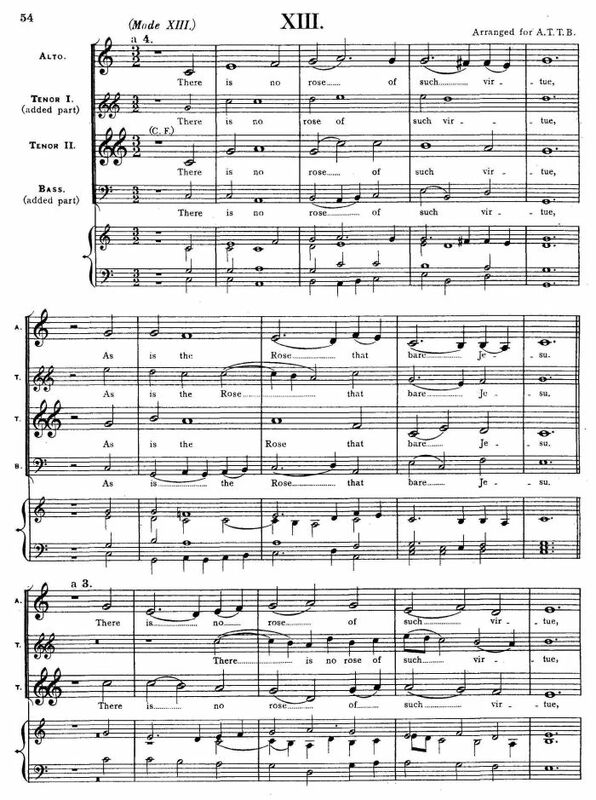 Sheet Music from Sir Richard Runciman Terry, A Medieval Carol Book: The Melodies Chiefly from MMS. in the Bodleian Library, Oxford, and in the Library of Trinity College, Cambridge (London: Burns Oates & Washbourne Ltd., 1932), Carol #31, p. 56. J. 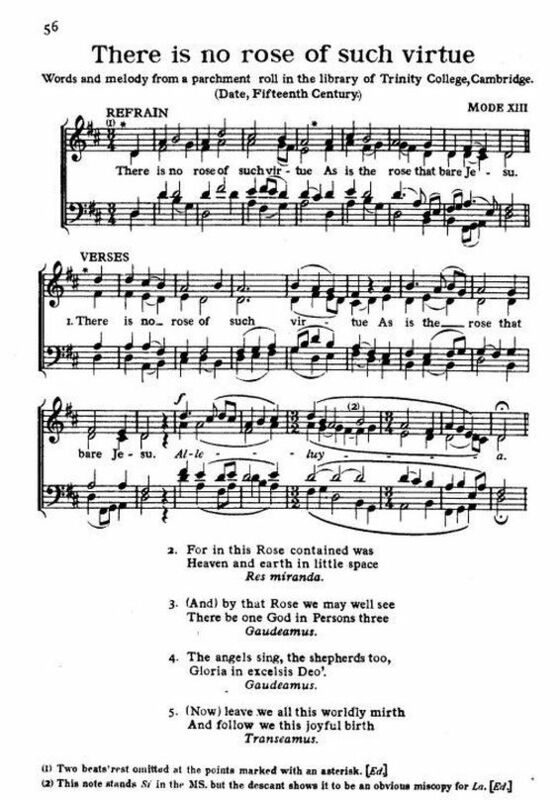 A. Fuller Maitland and William Smyth Rockstro, English Carols of the Fifteenth Century. London: The Leadenhall Press, E.C., ca. 1891, Carol No. XIII, pp. 26-27, 54-55. They note that the carol is difficult to decipher as there are several holes in the MS. at the end. Carol in Modern Form, pp. 54-55. Mode XIII, with music in four parts (A, T1, T2, Bass), and piano/organ accompaniment. 1. Two beats' rest omitted at the points marked with an asterisk. 2. This note stands Si in the MS but the descant shows it to be an obvious miscopy for La. "This is one of thirteen carols found in a Cambridge MS., T.C.C. O. 3. 58, part of which at least is attributed to John Dunstable of Henry VII's Chapel. It is quite uncertain whether he wrote the words as well as the music." Res miranda is translated as "Wonderful thing." Pares forma is translated as "Equal in form." Gloria in excelsis deo is translated as "Glory on high to God." Gaudeamus is translated as "Let us rejoice." Transeamus is translated as "Let us follow. "; another translation is "let us turn [from earth to heaven." 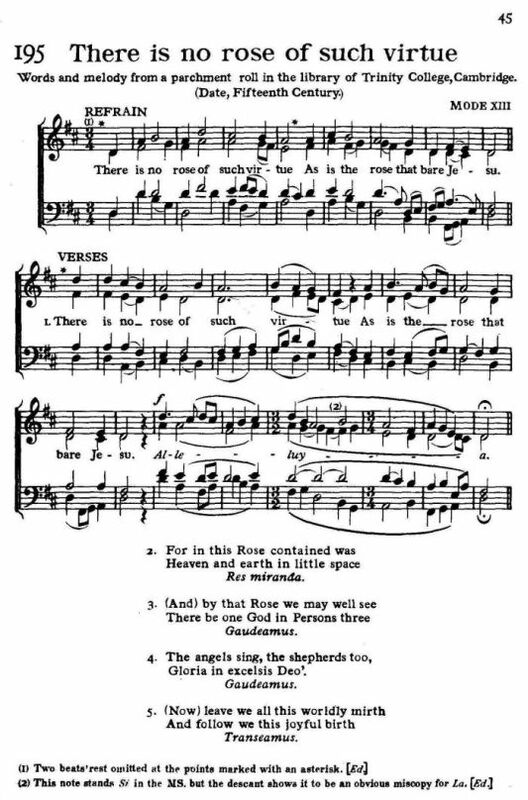 See Robbins, Early English Christmas Carols, p. 66. Also found in Richard Runciman Terry, Two Hundred Folk Carols (London: Burns Oates & Washbourne Limited, 1933), Carol #195, p. 45. Rev Terry notes that the words and melody from a parchment roll in the library of Trinity College, Cambridge. (Date, Fifteenth Century.). Mode XIII. See: Cambridge UK, Trinity College O.3.58 (1230) (opens in a new window at an external site). Also found in Richard Leighton Greene, ed., A Selection of English Carols. (Oxford: At the Clarendon Press, 1962), #46, p. 107 (the original form, 15th Century, citing Trinity College, Cambridge, MS. O. 3. 58). The modern form, according to the Index, is #76, but I was unable to locate it in the book. Carol #76, p. 138, has a first verse beginning "If thou serve a lord of prys." Also found in Richard Leighton Greene, ed., The Early English Carols. (Oxford: Clarendon, 1935), #173, p. 130. He notes "A few letters have become illegible from damage by damp." Also found in Rossell Hope Robbins, ed., Early English Christmas Carols. (New York and London: Columbia UP, 1961), #23, pp. 66-67, with notes and music for two voices. Also found in John Stevens, ed., Mediæval Carols. Musica Britannica 4. (London: Stainer and Bell, 1952, 2nd ed. 1958), #14, pp. 10-11, with music for two voices. A SAT musical setting was transcribed and edited by John Stevens, 1963, and is available from from Stainer & Bell, Ltd., London. The notes to that this carol state that it came from a manuscript roll of carols, copied out in the early 15th century and now in the Library of Trinity College, Cambridge. 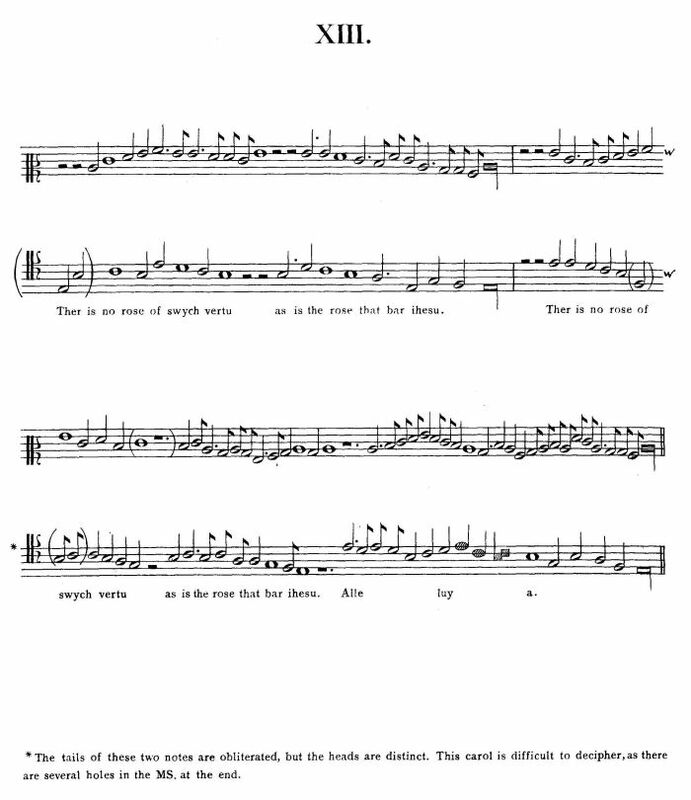 In that edition, the first verse both precedes and follows the verses, with a different musical line. The tenor line carries the melody. That setting also omits the sixth verse, above. The record at the excellent Digital Index of Middle English Verse (DIMEV) notes that another copy was found in the Holkam Hall Manuscript, #229 (three stanzas), citing Griffiths, Jeremy. 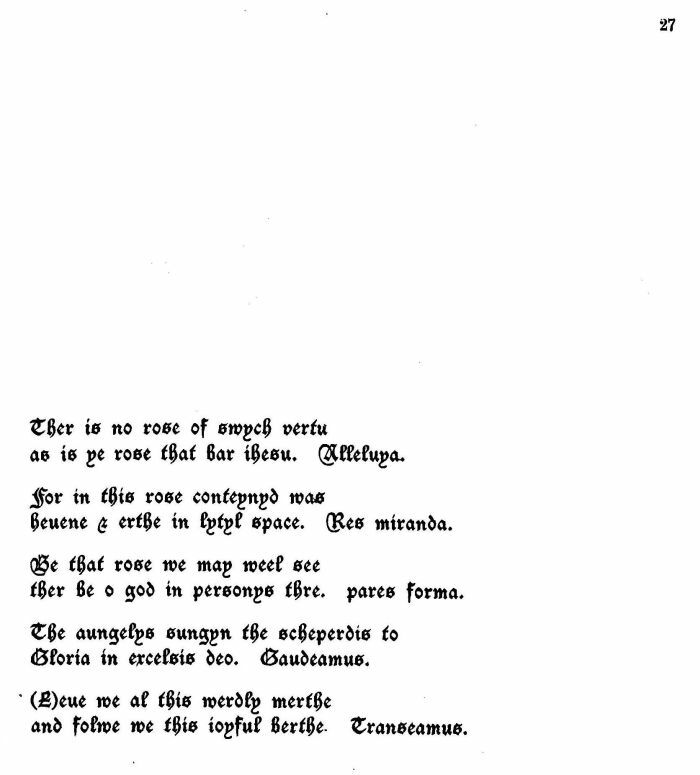 “Unrecorded Middle English Verse in the Library of Holkham Hall, Norfolk.” Medium Ævum 64 (1995): 278-84: 382.. See: There Is No Rose Of Such Virtue (opens in a new window at an external site). Another collection containing carols from a roll in the Library of Trinity College is J. A. Fuller Maitland, ed., English Carols of the Fifteenth Century From A MS Roll in the Library of Trinity College, Cambridge. (London: The Leadenhall Press, et al., 1891), with added vocal parts by W. S. Rockstro.